Sure, Thanksgiving dinner with your family is always great, but Friendsgiving is an occasion to show your closest friends you are thankful for them too. If you want to throw a legendary Friendsgiving this year, but don’t think you can afford it, think again! There are ways to show your friends gratitude while also being frugal. Considering most of your friends are also probably trying to be frugal, have them chip in! This can mean having everyone bring a different side dish for Thanksgiving dinner, or it can mean you put together a money pool and have one person do all of the shopping. It can also just be a BYOB event, since alcohol can quickly become the most expensive part of your Friendsgiving. No matter what you choose, everyone will save money in the long run if everyone contributes. Be sure to tell your friends to bring something different so you don’t end up with four pumpkin pies (unless you really love pumpkin pie). I know what you are thinking. How can you have a proper Thanksgiving dinner without the turkey? But that’s just it, this is Friendsgiving, so you can make it whatever you want! Turkeys can be very pricey depending on how many people you need to feed and they come out dry and tasteless half of the time anyway. There are a lot of more frugal and tastier options like just the turkey breast, pork loin, brisket or chicken. A lot of your friends are probably having turkey with their families for Thanksgiving dinner anyway, so why not switch it up and save money at the same time? The easiest way to be frugal is to shop at your discount grocery stores instead of the higher-end options. Stores like Wal-Mart and Food 4 Less will have the same options as other grocery stores at a cheaper price. In the days leading up to your Friendsgiving, watch out for local ads you get in the mail. A lot of grocery stores will have deals on typical Thanksgiving dinner foods like canned pumpkin, cranberries, yams, and other popular side dish items. In addition to discounted items, the stores will also most likely have coupons, so be sure to look out for those as well. If you are opting in for turkey, some grocery stores will even give you a free one if you spend a certain amount on groceries. If you are afraid you won’t make the minimum amount, shop with a friend to hit the target. It will be worth the free turkey! Unless you already have some leftover from last year’s Friendsgiving, it isn’t super necessary that you have decorations. Your friends will just be appreciative that you are hosting it at your house instead of theirs. If you still think that it’s not the same without, then shop at dollar stores for festive pieces. To be extra frugal, you may even be able to find some decorations in your own backyard. Thanksgiving decorations are basically just fall-like plants anyway. If you have a creative side, put some twigs, leaves and pinecones together for a table centerpiece. Like I mentioned before, Friendsgiving is whatever you want it to be. If you don’t want to have a full-on Thanksgiving dinner at your house, then opt for a Friendsgiving lunch instead! Having a lunch could help you save on alcohol and even food. Most people tend to eat smaller meals for lunch, so you won’t have to provide as much! The simpler you make the food, the more frugal it will be. 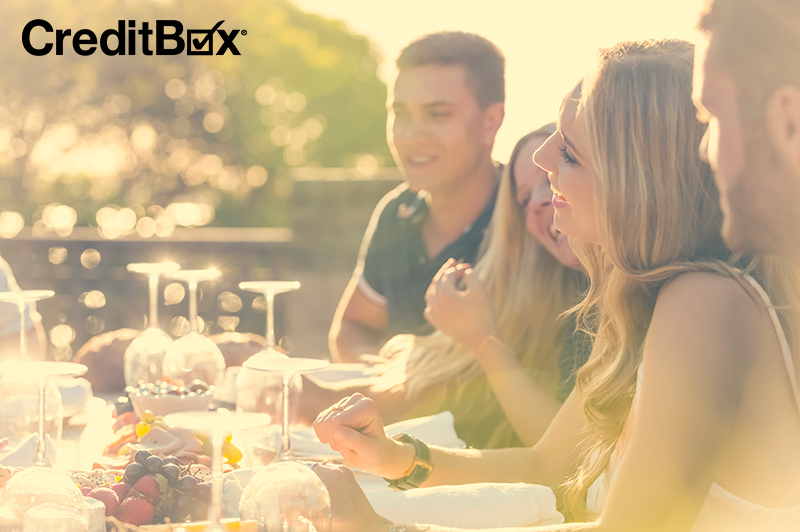 To throw the most epic Friendsgiving this year, apply now with CreditBox! Use our easy application to get next day funding and instant pre-approval online for loans up to $4,000.